The recipe is an amalgamation of two recipes. 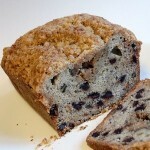 The banana bread recipe comes from here at Recipe Zaar. It uses sour cream. I already had another banana bread recipe, but I wanted to try something new. I adapted the recipe a bit to include chocolate chips. And because there were a lot of nuts in the streusel topping I was going to add to it, I reduced the chopped nuts from 1/2 to 1/3 cup. The streusel topping is from The Pioneer Woman Cooks! If you go to check out her recipe, you’ll see that The Pioneer Woman also knows how to take a darn good looking photo. I cut her recipe in half – and that’s what I have here – but I still found it was just a bit too much streusel, and I didn’t use all of it. However, in retrospect, when I added the streusel to the top of the bread I really could have pushed it down further into the bread mixture and thus added more, OR I could have made a centre “layer” of streusel in the middle of the bread. I regret not doing this extra layer. I have put it as an “optional” step in this recipe, but I really would recommend it. If you do add this middle layer, you may want to reduce the chocolate chips in the bread. Or use cinnamon chips. Or anything else you can think of! 1. Grease a large loaf pan. 2. Cream butter, sugar, eggs, and vanilla. 3. Add dry ingredients to the wet mixture, then bananas, then nuts and sour cream. Mix until well combined. 4. Add the bread dough/mixture to the loaf pan. 5. Add the streusel topping (see below). Don’t be afraid to push it down a fair bit into the bread, since the recipe here gives you plenty of streusel. 6. Bake at 350 degrees Fahrenheit for 1 hour. Optional Middle Layer: When adding the bread mixture to the loaf pan, only pour in half at first, then add some of the streusel topping to this first half of the mixture, not quite letting the streusel reach to the edges of the pan. Now pour the other half of the bread mixture on top of this, and then finally the rest of the streusel. 1. Combine all the dry ingredients. Melt the butter. 2. Add the butter a little at a time to the dry ingredients, mixing it in each time until small clumps form. 3. Add the streusel to the top of the banana bread in the pan (or to the centre, too) as per above. Using a fork, mix up the very top of the banana bread with the streusel, just so that not all the streusel falls off loose when the bread is done.